Why Does Beef Jerky Hurt My Teeth? Beef jerky is a tasty snack, but it causes tooth pain in some people. If you're experiencing pain during or after eating beef jerky and wondering why, there is a logical explanation. Although there are no scientific studies on why beef jerky causes tooth pain, exploring known tooth pain causes helps solve the puzzle. Beef jerky is hard and chewy and takes more effort to eat than soft foods. You need to chew it a lot before you can swallow a piece. Repetitive chewing puts pressure on tooth nerves, which can cause pain. According to Medline Plus, physical stress on teeth may cause temporomandibular joint (TMJ) symptoms, such as pain when biting or chewing, jaw pain, difficulty opening the mouth, or facial pain. It takes a fair amount of force to bite a piece of beef jerky. Additionally, to finish one serving, you must bite several pieces. Biting into any hard food may cause tooth pain. This is especially true if you have tooth decay or exposed gums. Beef jerky is on the sticky, thick side. As you chew a piece over and over, it's not unusual for a portion to get stuck between your teeth. This may irritate your gums, causing pain. If a piece of jerky comes in contact with or gets stuck in an area of decay, it will likely cause pain. Another consideration is the amount of sugar in your jerky. Some brands are glazed or flavored and have a fair amount of added sugars. If you eat jerky frequently without brushing your teeth, the sugar may lead to tooth decay and pain or irritate an existing cavity. You can take steps to lessen beef jerky's impact on teeth. Soften jerky by sprinkling it with water and putting it in the microwave for a few seconds at a time until it reaches the desired consistency. When buying jerky, look for softer brands such as Tilkamook Soft and Tender Beef Jerky or Country Cut's softer version. These varieties contain more moisture, making them easier to chew. Consider making your own beef jerky in your oven or a dehydrator. Not only will you control cooking time, but you'll know which ingredients and how much of them are included. Go easy on the jerky. Don't eat multiple pieces at once. When you eat jerky, bite down gently. Let each piece dissolve in your mouth a bit to soften before chewing. 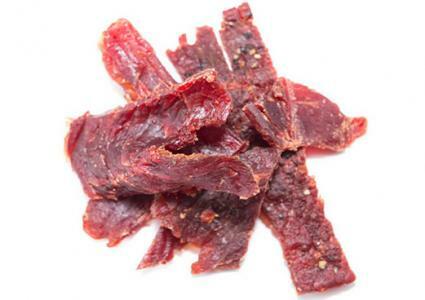 Break or cut the jerky into small pieces before you chew it. If you have braces, your orthodontist instructs you to avoid chewy or sticky foods. These foods may damage braces or get stuck under them, causing pain. Since beef jerky is both chewy and sticky, don't eat it if you have braces. Although it only takes one hard bite of jerky to cause tooth pain, limiting your intake is the best way to reduce your pain risk. If you experience pain while eating jerky, don't eat it for a few days. Then try again with a small piece. If the pain is still there, you may need to back off for a longer period. If you experience persistent tooth pain after eating or biting down on any type of jerky, contact your dentist for an evaluation.